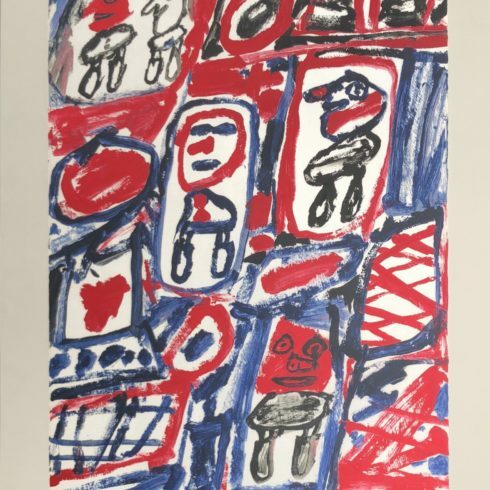 Jean Dubuffet Prints and Art for sale - Denis Bloch Fine Art Gallery Beverly Hills. Jean Dubuffet was an integral French artist known for his primal paintings and sculptures of vernacular subjects. Jean Dubuffet’s adoption of the term Art Brut or raw art, referred to the art of children, prisoners, and the mentally ill, was a reaction to what he called art culturel or refined art. It was his desire to break from tradition by implementing rudimentary mark making and emulsions made from sand, tar, and trash. Our Fine Art Gallery has the finest quality Jean Dubuffet original prints, lithographs, serigraphs, aquatints, artworks, and posters. We have a large inventory available off-site and we encourage you to make an appointment to see specific works you are looking to collect. We are happy to meet you at either our art gallery showroom or at your home or office for a private presentation. Artist, sculptor and printmaker Jean Dubuffet was born July 31, 1901, in Le Havre, France. Jean Dubuffet attended art classes in his youth and in 1918 Jean Dubuffet moved to Paris to study art at the Academie Julian, which Dubuffet left after six months. During this time, Jean Dubuffet met artists Raoul Dufy, Max Jacob, Fernand Leger, and Suzanne Valadon. In 1924, doubting the value of art, Jean Dubuffet returned to Le Havre where he gave up on art for about ten years and took over the Dubuffet family wine business. Jean Dubuffet committed himself to his art in 1942. Jean Dubuffet had his first solo art exhibition at the Galerie Rene Drouin, Paris, in 1944. Influenced by the art of Jean Fautrier, Jean Dubuffet started to use thick oil paint but mixed with sand and gravel, by which Dubuffet could model the paint as a skin in his art. Jean Dubuffet typically used archetypical figures and gestural brushstrokes in the art of this period showing a clear influence by artist Paul Klee. During the 1940s, Jean Dubuffet associated with artists and writers including Andre Breton, Georges Limbour, Jean Paulhan, and Charles Ratton. After 1946, Jean Dubuffet began a series of art portraits of the group. Jean Dubuffet painted these portraits in the same thick materials, and deliberately anti-psychological and anti-personal, as Dubuffet expressed himself in his art. 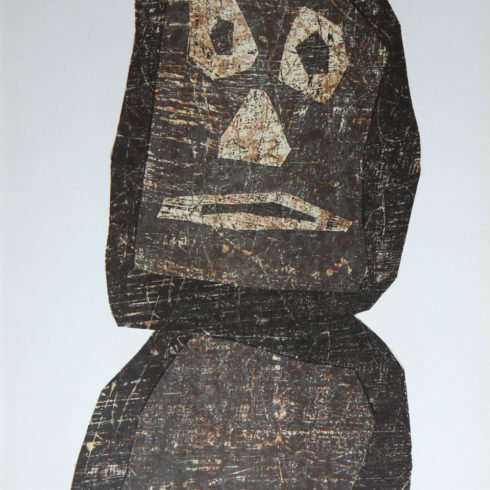 Since 1945, Jean Dubuffet began collecting works of art that Dubuffet referred to as Art Brut. Art Brut (meaning “raw art,” oftentimes referred to as ‘outsider art’) was highly spontaneous art created by untutored individuals working outside aesthetic norms, such as art by psychiatric patients, prisoners, and children. Jean Dubuffet amassed a collection of such art that is now housed at the Musee de l’ Art Brut in Switzerland. Jean Dubuffet sought to create an art with as much freedom as Art Brut, and the art of Dubuffet often appears primitive and child-like. In 1947 the Pierre Matisse Gallery gave Jean Dubuffet a solo art show in New York. From 1951 to 1952, Jean Dubuffet lived in New York. Dubuffet then returned to Paris, where a retrospective of Dubuffet’s art took place at the Cercle Volney in 1954. Jean Dubuffet had his first museum retrospective occurred in 1957 at the Schloss Morsbroich, Leverkusen. Dubuffet exhibitions were subsequently held at the Musee des Arts Decoratifs, Paris, in 1960–61; the Museum of Modern Art, New York, and the Art Institute of Chicago in 1962; Palazzo Grassi, Venice, in 1964; the Tate Gallery, London, and Stedelijk Museum, Amsterdam, in 1966; and the Solomon R. Guggenheim Museum, New York, in 1966–67. 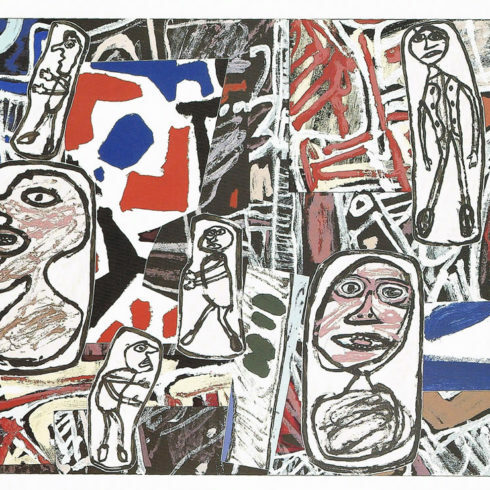 A Dubuffet retrospective was presented at the Akademie der Kunst, Berlin, the Museum Moderner Kunst, Vienna, and the Joseph-Haubrichkunsthalle, Cologne, in 1980–81. In 1981, the Solomon R. Guggenheim Museum observed Dubuffet’s 80th birthday with an art exhibition. Jean Dubuffet died May 12, 1985, in Paris.